I've just completed my first week of instruction at Maine Media Workshop, it was also my first time to the great state of Maine. I had a wonderful time during the week with some really great students. I'd like to thank the staff at MMW for running a wonderful venue and making me feel so welcomed. I would also like to extend a special thanks to my class assistant Jen, thanks so much for all your help! The photo at the top of the post is from a light demonstration while on location at the Lincoln Center school in Rockland, ME. 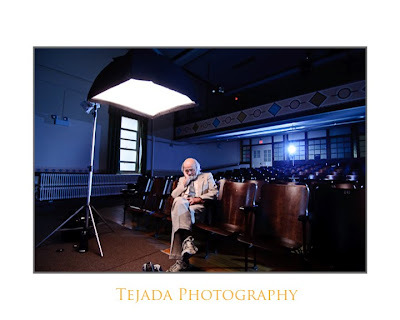 I did this photo in the small theater at the school, I find that a lot of students don't think about including a strobe within the actual frame of their photo. I used two SB-800's, I fired them using the CLS system build into my Nikon D-700, WB-daylight. The strobe at the rear of the photo had a full cut CTB (color temperature blue) gel on it and was fitted with a grid. The front light is a FourSquare™ boomed overhead and slightly forward of the subject. You can see the set-up in the image below. Seated in the theater in the production image above is Peter, one of the 4 models we had available for the students to photograph while at this location. We also made a visit to Firefly Restorations in Hope, ME. Peter stood in front of this wonderfully restored Fire Truck giving me his best Jack Nicholson. Peter is lit with a single SB-800 with a full cut CTO on it, WB-daylight. 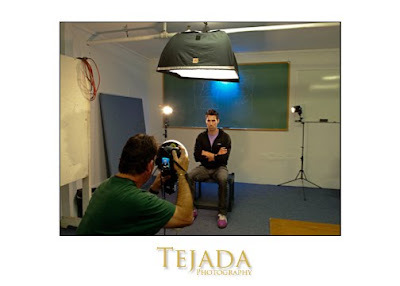 The photos below show another lighting demonstration we did in class one day. 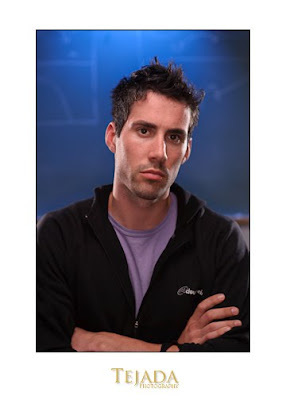 Anthony shown here, needed a new photo of himself for this coming seasons ski pass. I used the chalkboard in the classroom as the background for his portrait. The key light was an SB-800 inside of my FourSquare™ clamped to an overhead pipe. I had 2 SB-800's placed behind and to each side of Anthony for the kickers, these were fitted with Full CTO gels and barn doors which help prevent flair into my lens. I also clamped another SB-800 onto the chalkboard using a Justin Clamp, this flash was also fitted with a full CTB gel and a foam cutter to prevent any forward spill onto the back of Anthony. To round out the shot, I used an Orbis Ring Flash for some fill. The ring flash is a wonderful tool to use when adding some fill. Here is the set up for the photo shown above. 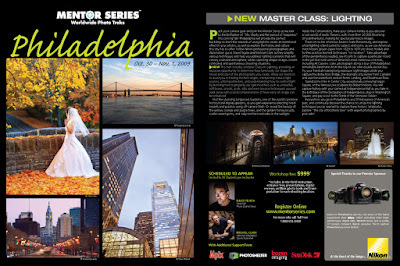 We have a few more spaces left for the Philadelphia, PA Master Lighting Mentor Series Trek. I'll be joining super shooter Michael Clark teaching this Trek. The workshop starts on Oct 30th and runs until Nov 1st. We'll be shooting at two super locations, Longwood Gardens and at Eastern State Penitentiary. These Treks are well organized and are a lot of fun. Philadelphia is a beautiful city and both locations are fantastic, I hope you'll join us. Here is the full info as it appears in the most recent issue of POP Photo. 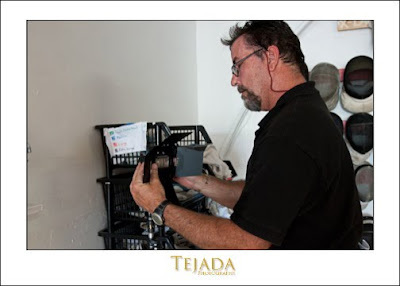 illumination gurus David Tejada and Michael Clark as they simplify various techniques and help you address lighting scenarios that will convey a desired atmosphere, while capturing unique images in both controlled and spontaneous shooting situations. soft boxes, snoots, grids, silks and even bounce techniques, you will walk away with a solid comprehension of how easily an image can be enhanced. Visit the stunning Longwood Gardens, one of the world’s premiere horticultural display gardens, as you gain experience directing hired models and practice using off-camera flash. Or reveal the beauty of the yellow, orange and purple trees, and the golden honey locusts, scarlet sweet gums, and ruby northern red oaks in the sunlight. a lush world of exotic flowers, with more then 20,000 blooming chrysanthemums, making for spectacular macro images. Travel on to the infamous Eastern State Penitentiary, and explore what lighting is best suited to subject and scene, as we use America’s most historic prison (open from 1829 to 1971) to shoot models and further practice learned techniques “on location”. Take advantage of the penitentiary’s vaulted, sky-lit cells to capture a particular mood in the jail that held some of America’s most notorious criminals, including Al Capone. Later, photograph along a tour of Philadelphia’s remarkable landmarks from the top of our own double-decker bus. Try your hand at making long exposure night images while you capture the Betsy Ross Bridge, the dramatic city skyline from Camden and visit the waterfront area of Penns Landing, and Boathouse Row. Spend some time in Center City, exceptionally conveying Logan Square, or the famous Love sculpture by Robert Indiana. You will capture history with your camera at Independence Hall as you take in the birthplace of the Declaration of Independence, stop in Washington Square, and pay a visit to the Tomb of the Unknown Soldier. Everywhere you go in Philadelphia, you’ll find a piece of America’s past, and continually discover the chance to utilize the lighting techniques you’ve learned to capture these historic landmarks. Explore “the city of brotherly love” with expert photographers by your side! 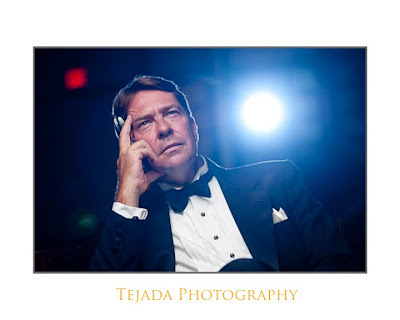 I have recently join the fine folks over at the Perfect Picture School of Photography! I'll be teaching a 4 week course centered around my popular Small Strobes, Big Results workshops. I'm very honored to joining such great instructors such as, Chris Hurtt, Bobbi Lane, Charlie Borland, Bryan Peterson and so many others. 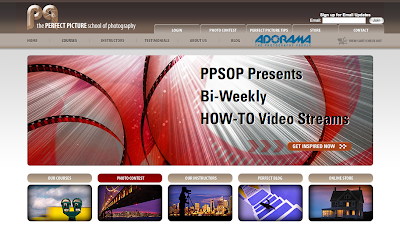 If your looking for truly outstanding online courses, there is just one place to look, PPSOP! My first 4 week course starts October 9th, I hope you take the time to join my class. 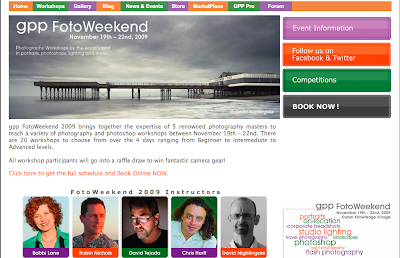 I'll be teaching in Dubai at GPP November 19th - 22nd, 2009. I am delighted and thrilled to be teaching along side such wonderful professionals like Chris Hurtt, Bobbi Lane, Robin Nichols and David Nightingale. I'll be teaching a 2 day workshop focusing on corporate and industrial photography as well as two one day "Small Strobes, Big Results" workshop. It will be my first time to the UAE and I am very much looking forward to it. These are going to wonderful workshops and if your in the area, I'd love to see at the workshops. I have recently begun working on an annual report for a long time client on mine. 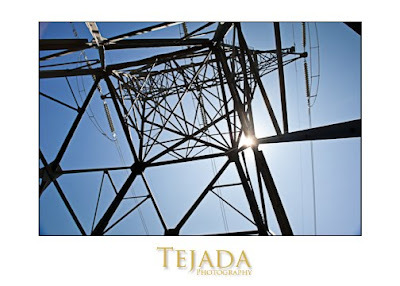 My client is a Touchstone Cooperative who owns power plants and transmission lines. I have shot their annual report for years and it is now time to start this years annual. Quite often when I head out on assignment for them, we have several other project to shoot other than the annual report photography. These portraits may or may not appear in their annual report, they may end up in their monthly magazine. 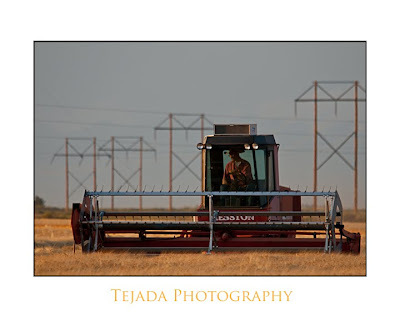 Erik and I had two days of shooting in the San Luis Valley in southern Colorado. We were shooting a variety of subject matter, combines harvesting fields, portraits around solar panels and a potato farmer Scott. This particular post will be devoted to the solar panel portrait portion of the assignment. Before heading down to the San Luis Valley, I was told that we were scheduled to shoot portraits at a solar plant near Alamosa, Colorado the following morning. 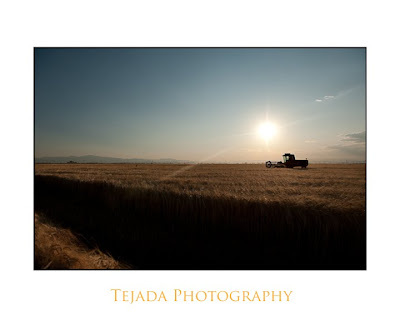 Erik and I left for Alamosa early in the morning, allowing us plenty of time to shoot alone the way. 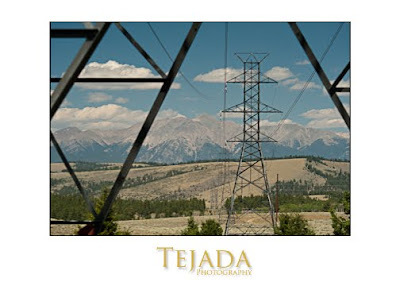 I was asked to photograph some new power lines which had been recently installed over Poncha Spring Pass alone Colorado Hwy 285. We took our time going over the pass, turning on various forestry roads looking for good vantage points to photography those power lines. By the time we had reached this location it was near mid day, and the light was a bit harsh. After photographing various angles on power lines we continued our trip to the Alamosa. 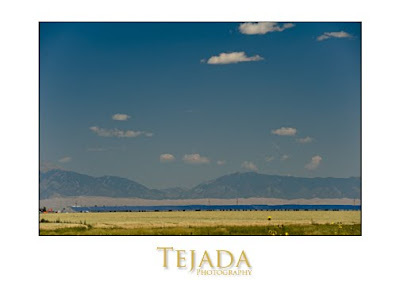 Just 17 miles north of Alamosa is a small solar plant which Sun Edison operates and my client providing the power lines to deliver the resulting power. We drove around the solar plant scouting for locations for the portraits we knew we were going to be shooting the following morning. I was told that there was a small sub station on the north/west corner of the property, and my client wanted the substation in the background of the photos we're going to shoot. Based on the placement of the sub station, I needed to be inside the solar plant property to get the photography my client asked for. I made a few personal photos of the plant while scouting the location for the morning shoot. 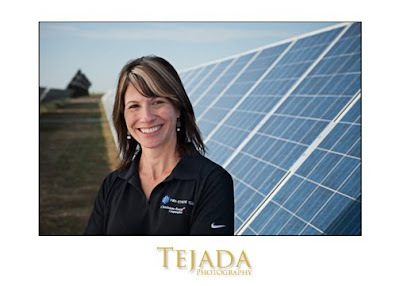 On the morning of the photo shoot at the solar plant, I learned that my client was unable to make contact with the appropriate person to gain access to the plant. 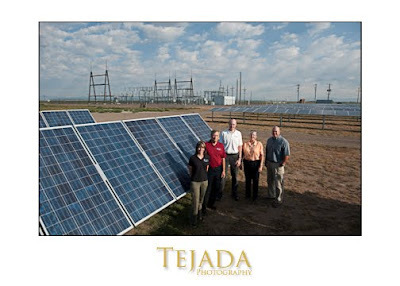 I had about 30 minutes to come up with a solution, photographing a group of 6 or 7 people in a location that says solar power and delivery. We drove out to the plant prior to the arrive of the individuals who were to be photographed, looking for a solution. When we arrived, I noticed a repair or maintenance crew on the property. I caught their attention and spoke to them about the situation at hand. I told them that we had be trying to get permission from a certain gentlemen with Sun Edison and that we had not yet heard back from him regarding gaining access to their property. As it turned out, these workers made a quick phone call which quickly allowed us the access we desired. Once on the property, I was able to position the group of 6 near solar panels with the sub station in the background. With the aid of a 6 foot ladder, I was able to get a higher angle to see more of the sub station as well as seeing more solar panels. After shooting the group, I was asked to make several individual portraits as well as smaller group shots. The photo at the top of the post was photographed utilizing a 42" square lightform panel with a diffusion fabric over the frame. Erik moved the panel into the frame from the left side until I could just see it, and than backed it out just out of frame. Using a panel like this produces a soft light on the subject. 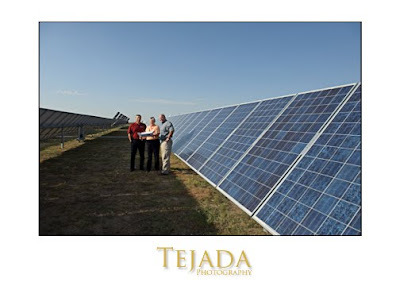 Here are a few more images from our morning shoot at the solar plant. In this image you can see the sub station in the background on the left side of the frame. 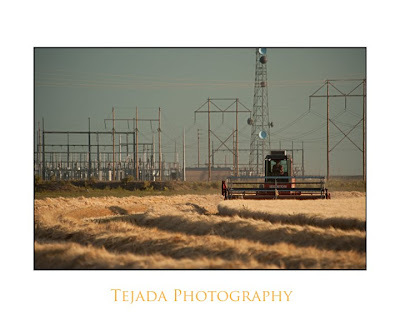 If I had to shoot this without being on the solar plant property, I don't know what I would have done. We also shot a little video to go alone with this assignment. It may be hard to see in the small photo above, in this 30 second exposure I managed to capture the Space Shuttle passing over head. Click on the above image and see if you can see the light streak in the center of the frame. Here is a link to the scheduled viewing of both the Space Shuttle and the International Space Station. 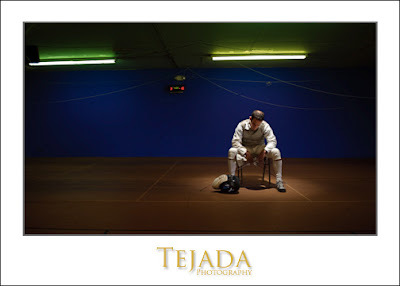 In part 1 of my fencing shoot, we combines a small amount of ambient light with a single flash with a grid. With this photo, I killed the ambient light choosing instead to light the entire scene with strobes. I used a much softer quality light on my subject, opting for a overhead softbox. I positioned my subject in front of a wall rack full of fencing masks, the repetitive pattern of the masks made for a nice background. For this series of photos I untimely ended up using 4 Nikon SB-800 strobes. The strobes all fired using the Nikon CLS system. My key light is a single SB inside a FourSquare™ the strobe was set to group A and boomed overhead. A used a Quantum Turbo SC battery to power the strobe. For the rim or kicker lights, I had two SB-800's, each with a full cut CTO (color temperature orange) gel on the flash head. I used a set of barndoors on each strobe to control the spread of light and help prevent flare in my lens. I assigned both strobes to group B as they had the same distance to travel and both strobes received the same amount of power. Just as a side note: All strobes assigned to a particular group in this case group B, will all fire at the same power level. 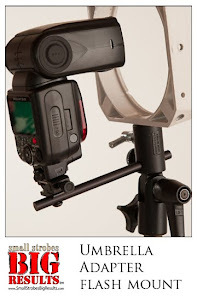 You can not adjust each strobe independently if they are assigned to the same group. The background flash was an SB-800 with a full cut CTB (color temperature blue) gel on it. A CTB gel converts a tungsten light source to daylight. Since the strobe is already a "daylight" balanced light source, the gel raises the kelvin temperature which has a cooling affect on the light. The flash head was zoomed to 50mm and place into group C.
From my camera position and using the SU-800 commander, I was able to shut off the various groups to show the build of lights. In the following series of photos you can see the progression of adding lights on the subject. The first with just the key light, the second with the addition of kickers, and the third with all strobes firing including the background. Here I'm fitting one of the rear kicker strobes with a barndoor. These are really inexpensive modifiers and I use them a lot. They cost about $10.00 each. You may have notice that I make no mention about what power settings I'm using. Personally I don't care, I make a creative choice to shoot at certain aperture and than adjust the power on the strobes to fit that. I wanted a shallow DOF to soften the background, that happened to be f/2.8.My son Chris shot some video during the shoot, it shows the photographing of both part 1 and part 2 of these posts. 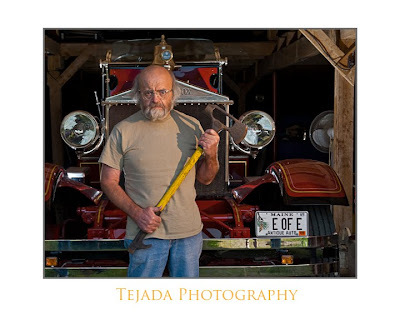 I might also add that I have two other Nikonian workshops coming up, Philadelphia & San Diego. This is another project for myself similar to the archer I did several weeks ago. 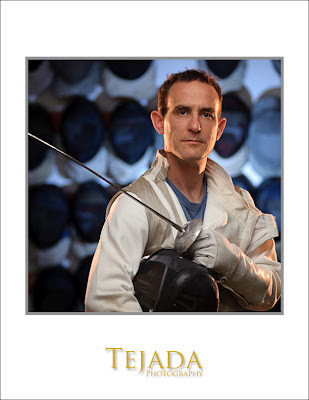 I contacted a local fencing school in Denver, and asked if it was possible to photograph at their facility. I was granted permission and did so this past weekend. I was hoping that the owner would also model for me, however, he suggested another individual that he thought would be perfect. 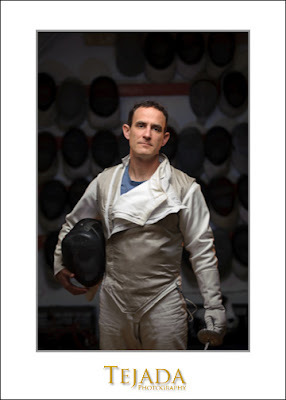 I had the pleasure to photograph fencing enthusiast and high school teacher John K. We made arrangements to met at the school at 2 PM last Saturday. Normally it would have been full of sword fighting students, except that classes don't start for another week or so. John was kind enough to give me an hour of his time, he keep busy grading papers while I worked out lighting solutions. I was able to get 3 images in the shot time I was there, the photo at the top of the post is probably my favorite. My son Chris came with me on the shoot, he shot some production stills which I'm including here. Let's talk about the image at the top of the post first. I used one Nikon SB-800 attached to a Bogen Justin Clamp and fastened to a pipe on the ceiling. I powered the strobe using a Quantum Turbo SC battery. I put a small 30-degree grid on the flash, which provide a concentrated pool of light where my subject sat. The strobe was fired using a Nikon SU-800 commander on top of my D700. There was an open garage door to the right of my shooting position, which provide the ambient fill in the room. Most of my exposures were at a shutter speed of 1/250, I liked the deep dark mood it created. 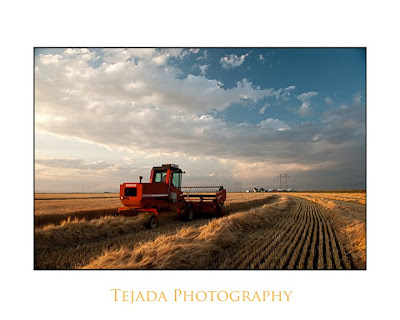 The following sequence of images show how dragging your shutter and allowing more ambient light into the scene changes the entire mood of the shot. 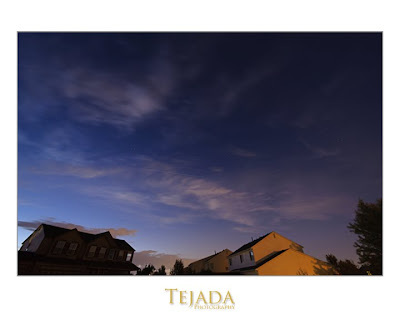 This series of images running from left to right increase in exposure by one stop increments. The aperture remains the same in each image, only the shutter speed changed. I slowed down or dragged the shutter in order to let more ambient light into the exposure. Remember, shutter speed controls ambient light and aperture controls the flash exposure. In Lightroom, I added a green cast to the florescent light on the ceiling. I like the mix of the blue wall and a green cast of the florescent lights. I also removed the cord powering the score/timer on the wall. 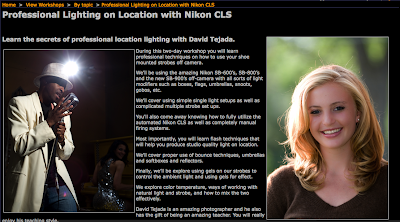 I have a few spaces left for my September 26th Small Strobes, Big Results workshop in Denver. 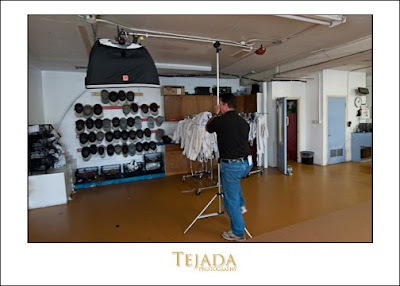 If you would like to learn more about how to achieve studio quality light on location, this workshop is for you. Give me a call or drop me an email if your interested.